The Manhattan is a classic cocktail, that unlike many, never faded away. I use to enjoy one every decade or so, but now it has become one of my standards. 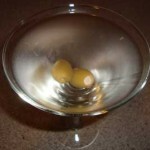 Manhattan, Shaken not Stirred, being pouredbecome one of my standards. Allegedly the Manhattan was invented by Dr. Iain Marshall in the early 1870s at the Manhattan Club in New York City, and named after the club, although the story is doubtful. 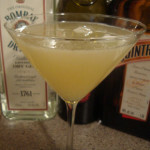 It’s a pretty simple cocktail, although most bartenders and others do NOT make a great one. Very few ingredients: what can go wrong? Only Whiskey, Sweet Vermouth, bitters, and a garnish. Whiskey: Rye whiskey is what the recipe calls for, and although when I was a kid very very few Ryes were available, there are a plethora of Rye whiskeys available today. 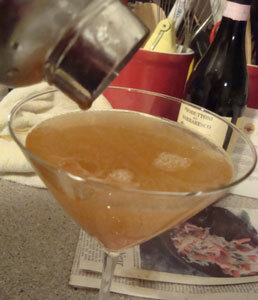 Old Overholt is cheap and has plenty of character for a Manhattan (although it isn’t great by itself!). Doc Halliday drank it. Jefferson Rye makes an awesome Manhattan. Bulleit Rye gets two thumbs up. Most Manhattans are not made with Rye today as they have been traditionally. Bourbon like Makers Mark or Tennessee Whiskey like Jack Daniels are popular, and make a good, although different, Manhattan. Canadian Whiskeys (which are often mostly Rye) work. I even think Jamesons Irish Whiskey rocks in a Manhattan. The Whiskey is not critical as long as you like it (these words border on sacrilege to many!). Sweet Vermouth: Vermouth is “an aromatized fortified wine flavored with various botanicals” (ref:Wikipedia) and you want to use sweet vermouth (which is red). The vermouth matters! Dolin and Carpano Antica Formula vermouths are great. Cheaper brands are, well, cheaper and taste it! Keep your opened sweet vermouth in the fridge to help prevent oxidation. Bitters: Angostura bitters are traditionally used and widely available. Bitters are simply a strongly botanically infused alcoholic mixture used very sparingly. You could try another type of bitters, but I stick with the classic. Maybe I’ll experiment someday. The Garnish: Most commonly a Maraschino cherry. DO NOT buy those FLUORESCENT red cherries designed for kiddies ice cream sundaes,and fruit cakes etc. You want a good cherry. It matters. I am currently using Sable & Rosenfield Whiskey tipsy Cherries and they are pretty good. Find decent cherries in your grocery story in the drink mixes section or your liquor store. You can use a piece of lemon or orange peel instead or in addition. One of the best Manhattans I ever had used a piece of orange, about 1/2 inch by 2 inches long that had been briefly flamed at both end by a lighter. 1-3 dashes Angostura bitters. I like 3 dashes. Yes, you really need bitters and a small container lasts me well over a year. Mix with ice. Stir or shake. 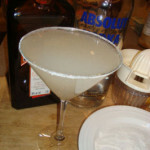 strain into a cocktail glass and serve with garnish. Enjoy. Notes: Stir or Shake? Many insist a Manhattan must be stirred, not shaken, but quite frankly it doesn’t matter to me, unlike with a gin (real) Martini which must be stirred. Some even serve a Manhattan on the rocks. I never do, but was handed one on the rocks in Nashville last week that was wonderful. The longest lived Rock Stars drink responsibly, although perhaps not their entire careers. So the cherry matters a lot? The garnish can make a massive difference at times. Last night I had a Grey Goose Martini, and used a twist from my friend Paul’s lemon tree in LA – I just hand carried some back after a Security Essentials class out there. Now I didn’t do a double blind taste test or anything (yes, sometimes I do things like that), but it sure seemed to matter.